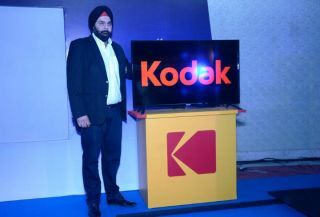 American imaging giant Kodak in partnership with Noida based Super Plastronics Pvt. Ltd. has announced the launch of 5 LED TVs in the Indian market. Kodak's LED TVs will be available in three screen sizes- 32-inch, 40-inch and 50-inch and will offer internet connectivity and Wi-Fi capability. The product range will be made available on all leading online e-commerce platforms starting with Shop Clues, Flipkart and Amazon post August 15, 2016. While the 32-inch models (HD X900S and HDXSMART) and the 40-inch models (FHDX900S and FHDXSMART) are offered in both standard and smart variants, the bigger 50-inch model will only be made available in Smart TV variant. The 32-inch HD X900S features a 250 Nits Samsung panel and supports USB to USB copying. The TV comes with a glass cabinet, 4GB flash storage and 512MB memory. The 40-inch Kodak FHDX900S comes with a 300 Nits Samsung panel and also offers USB to USB copy. The Kodak 40 FHDXSMART model has 300 Nits Samsung panel, 4GB flash storage, 512MB memory and supports USB to USB copy. The TV also has MHL connectivity. The bigger KODAK 50FHDXSMART TV comes with all the features that are offered by 40-inch FHDXSMART, expect that it has a bigger 50-inch display. The company has only mentioned the starting price of the TV range and will soon reveal the prices of other models. However, it claimed that the products will be priced between Rs 13,500 and Rs 40,000. The TVs are powered by ARM Cortex A7 processors paired up with 512MB RAM and 4GB of internal storage. The LED panels come with wide viewing angles and also include features like progressive scan, yPbPr colour space and a response time of less than 8ms. The TV sets run on Android 4.4 Kitkat and has HDMI, USB and VGA support as connectivity features. Kodak's LED TVs will be on sale starting August 15. While the 32-inch TV will be available exclusively on ShopClues, the 40-inch and 50-inch variants will be available on both Amazon and Flipkart. Kodak HD LED TVs will compete with the recent offerings from LeEco and Micromax TVs.